PHILADELPHIA (CNS) — As confetti rained down and cheers filled the air on the final day of the World Meeting of Families Sept. 25, a family from Argentina applied brushstrokes to a mural depicting Pope Francis — pushing the number of contributors to the paint-by-numbers mural past 2,263 and into the Guinness Book of World Records. Catire Walker and Noel Zemborain and their four children had traveled 13,000 miles through 13 countries to attend the World Meeting of Families, joined hundreds of people at the gathering in helping to paint the mural that will eventually be permanently displayed at the future home of St. Malachy School in Philadelphia. Carlos Martinez, director of records for Guinness World Records, certified the accomplishment. Cesar Viveros, the Philadelphia muralist who designed the artwork, told the Catholic Review, newspaper of the Baltimore Archdiocese, that he was overwhelmed and surprised to see so many people contribute. 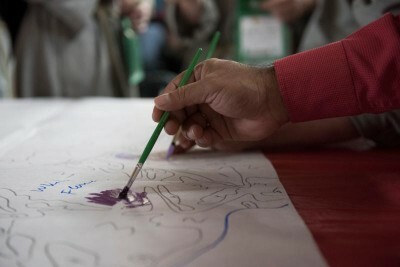 A delegate to the World Meeting of Families applies brushstrokes to paint-by-number mural at the World Meeting of Families in Philadelphia Sept. 22. (CNS photo/Jeffrey Bruno) See WMF-MURAL Sept. 26, 2015. The art was commissioned by the World Meeting of Families and the City of Philadelphia Mural Arts Program. “The Sacred Now: Faith and Family in the 21st Century” was crafted from 153 panels measuring 5 feet by 5 feet. In a morning news conference, Jane Golden, executive director of the Mural Arts Program, said the project achieved its goal of including people from many cultural backgrounds across the city, throughout the region and around the world. 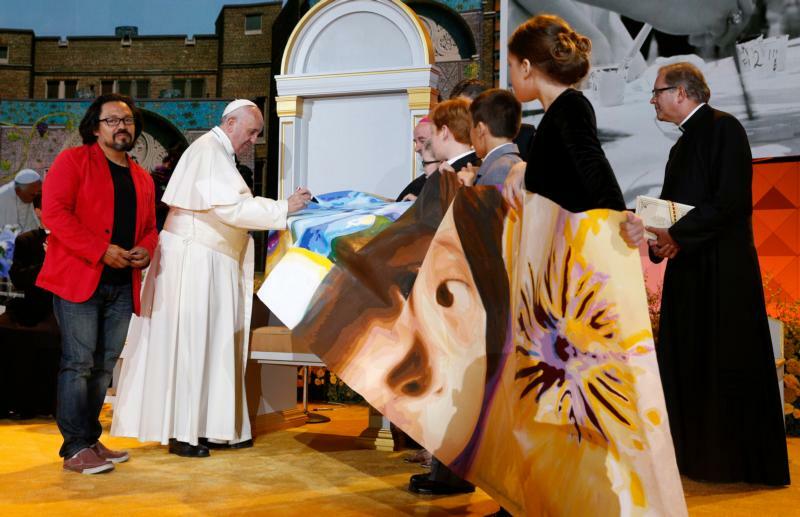 Working on the design, which features Pope Francis and diverse images of children, had a spiritual impact on the artist. According to the Mural Arts Program, 330 gallons of mural paint will be used on the final project and 565 shades of color hand-mixed by the artist. The final mural will have more than 1.6 million brushstrokes applied. On Sept. 26, during the Festival of Families in front of the Philadelphia Museum of Art, Pope Francis signed the last piece of the mural — writing “Francis” in “nice big letters,” said a news release from the Mural Arts Program. Matysek is assistant managing editor of the Catholic Review, newspaper of the Archdiocese of Baltimore. To have contributed to this mural by a few brushstrokes (my number was 1 & beige paint)was such a unexpected gift. And, as a 73 yr. old “artist of the everyday”, no gift for painting; I get an added kick out of knowing I am in the Guiness Book of World Records. I hope I don’t miss the date of the dedication; so, I can arrange to bring my grandkids, if possible. The WMOF, was incredible & spiritually uplifting. Participating w/world Pilgrims filled me up with hope & enthusiasm for my own Catholicity. God is good & I am so grateful to Him first; & my parents for choosing to consecrate & Baptize me right into the Heart of Jesus Christ. Thank you my Archbishop Chaput, for being so instrumental in having this meeting here, & hosting our Loving Pope. Maria Sacco, St. Paul’s Church, East Norriton, PA.